Uplift your home with the bright freshness of lime and citrus, mellowed with soft, silky bergamot and vanilla. Say hello to the No. 6 Lime & Citrus Candle from Parks, and look forward to bright and satisfying fragrance throughout your home. Our No. 6 luxury scented candle begins with invigorating base notes of fresh citrus fruits, including lemon zest and a twist of lime. This medley of clean citrus notes sets the scene for a revitalising and awakening fragrance, and one that’s ideal for the kitchen, dining area or home office ¬– helping to eliminate odour and help you feel more awake and energised. To balance the clean, fresh fragrance of lime and citrus, we’ve poured in bergamot. This dense floral extract adds mid notes of musk and spice, changing the character of the bouquet for a more balanced and well-rounded fragrance. Natural vanilla extract serves as a final flourish, and this smooth, mellow fragrance helps to refine the blend, adding a rich creaminess that perfectly complements the fresh citrus flavours of lemon and lime. No. 6 Lime & Citrus is part of our Exclusives collection – luxury home fragrances carefully-developed by our skilled perfumers to bring unique, long-lasting scent to your home. The candle is made from 100% natural wax, which allows for more true and authentic scent, and benefits from approximately 50 hours of burn time and our signature soot-free wick system, which produces pure, long-lasting fragrance. Supplied in a luxury presentation gift box, the No. 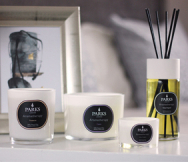 6 Parks Exclusive makes the ideal gift for friends and loved ones as passionate about home fragrance as we are.